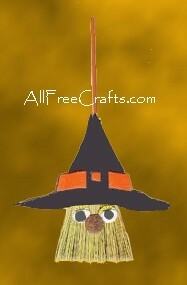 Mini brooms are very inexpensive, so you could make quite a few of these wee witches on a frugal budget for Halloween decorating. Print out the witch hat pattern or just make a triangle hat pattern of your own and cut from felt. Glue two of the triangle hat pattern onto the broom, placing it far enough down on the broom that only the witch’s eyes and nose show. Glue on the band of the hat, a small black square and a tiny orange square. Glue on the googly eyes and one brown pompom for the nose. You can make a pin out of this project – just add a pin back. Alternatively, just loop on a piece of string and hang in the window, or glue on a magnet and stick to the fridge.